There is increasing interest these days among my fellow Mommies in cloth diapers. For some it is because of an ever growing awareness of the need to care for the earth’s resources. Other’s the knowledge that it is the healthier choice for their babies and even more that it is cheaper. In these ever increasingly difficult economic times for many people the cost factor is becoming more compelling. The problem with the cloth diaper world these days vs. when our Mom’s were cloth diapering is the exact opposite of the one they were dealing with. We have too many options and it becomes terribly confusing for those new to cloth diapers. First, the some of the terminology. All in one means exactly what the name implies. In it’s simplest form it means that the diaper has a cover, padding and extra pad of absorbent material all included and sewn together into one complete diaper. These are the easiest to use, being every bit as user friendly as disposable diapers. As such they are enormously popular among Daddy’s, babysitters, nurseries etc. The primary downside is the cost. These are one of the most expensive cloth diaper options. A secondary downside is the drying time. A few companies have come up with some clever designs to help speed drying time but, as a general rule these are ‘long dryers’ Many families opt to buy a few for the sake of people unfamiliar with cloth diapers when they have to leave for a while and use a cheaper option for the day in and day out. Fitted diapers are available in a variety of materials. 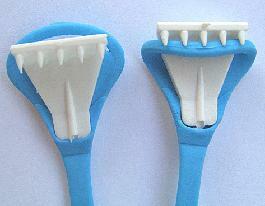 They are designed to be used with a cover. The advantage of fitteds is that you get a trimmer fit than with many other CD options. They also come in a large variety of colors and patterns which ups the “fun” factor. The argument has been made that there is no point in purchasing a cute diaper if you are just going to cover it up with a cover. Others counter with saying it’s similar to wearing cute undies just so you know they are there. =D Plus, there are some very cute covers available these days. Fitteds are also on the “higher” cost side of available cloth diapers particularly if made of more expensive material like Organic Bamboo. A long drying time is also a frequent complain of fitted diapers. These are also considered to be very user friendly and do not require stuffing and un-stuffing like Pocket Diapers do (an explanation of those later). Fitted cloth diapers can be purchased in two ways. 1) Fitted sizes in small, medium, large and extra large. This is the most expensive but provides the most exact fit per the babies size. The reason it’s so expensive is you keep having to buy diapers in the next size up. 2) One Size Fits All This is managed by a series of snaps that can be adjusted as the baby grows. Usually comes with some extra layers of cloth that can be laid into the diaper as the baby grows bigger and needs more absorbency. Although the up front cost per one size fits all diaper is definitely higher in my opinion the savings in the long run is worth it if you stick with cloth diapering longer than a few months. These have become increasingly more popular due to the more affordable “models” available these days and the wide range of options that can be done with them. A pocket diaper has a water proof cover so no extra covers are needed but instead of having sewn in layers of fabric for absorbency like the AIO’s they instead usually have a thin sheath of micro-fleece. 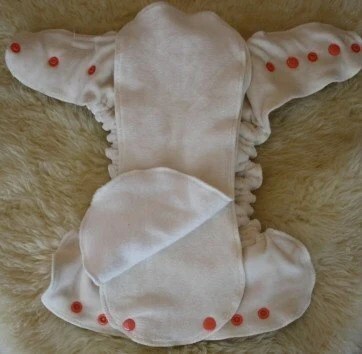 The micro-fleece is what is against the babies skin and serves to efficiently wick the moisture away to the absorbent insert stuffed into the interior. Pocket diapers can be stuffed with a huge variety of things. Anything from folded cotton pre-folds to a large array of specifically sewn and created absorbent pads in all sorts of cloth/material. Like the Fitted Diapers, Pocket diapers can be purchased one size at a time or in one size fits all adjustable sizes. Again, I am a fan of the One size Fits all option because in the long run it is a savings. For some people though a precise and trim as possible fit is the most important thing. Also, due to the flexibility in purchasing material to “stuff” them with it gives a lot of options as to how absorbent the diaper needs to be. Extra absorbent material like hemp/bamboo can be added for naptimes and bedtimes. Another advantage of the pocket diaper is that when they are “stuffed” ahead of time they are every bit as easy to use as the AIO’s. A complaint some have about pocket diapers is that some models have to be “un-stuffed” before washing which means touching the urine or poop saturated material. Manufacturers are becoming more sensitive to this issue and there are several versions available now that are “hands free” and advertised to “unstuff” themselves in the washing machine. Others have come up with some other ways to make it very easy to “unstuff” the diapers. In my personal experience with three different brands of pocket diapers unstuffing requires no more contact with grossness than unsnapping/velcroing a fitted diaper or peeling a pre-fold diaper out of a cover. Most of it can be done hands free with a little creative diaper “jiggling” over the diaper pail or washing machine. Pocket diapers, because they literally “dismantle” have some of the best drying times of any cloth diaper choices. The inserts typically dry faster than the pockets themselves but it is still significantly faster than most Fitteds or AIO’s. These are the old time classics that pop into most peoples minds when they hear the term “cloth diapers” They are usually considered synonymous with crunchy plastic pants and scary looking diaper pins. These are hands down the cheapest of the cloth diapering options, especially if a cheaper cover is purchased to go along with them. The two most common types of prefolds are Chinese Cotton and Indian Cotton. There are also so more eclectic options available in pre-folds…Made of hemp, bamboo or some combination of both with cotton. The only reason for someone to invest in something other than cotton is if something extra absorbent is needed and for whatever reason fitted diapers out of those materials are not wanted. Can be obtained in organic, unbleached, bleached although without chlorine. Pretty much whatever is wished for by the parent is quite affordable in pre-folds. Cotton pre-folds have to be purchased in individual sizes and that can add up after a while but they are so much cheaper than the other alternatives they are usually still cheaper than the one size fits all alternative options. Cotton pre-folds have some of the best drying times of any of the cloth diaper options available. Chinese prefolds benefits: Typically heavier duty stitching, probably made of twill. Due to being made of a heavier-weight fabric and stitched with a thicker thread, these prefolds will probably stay nice longer than the Indian prefolds. Chinese prefolds drawbacks: May pill up more than the Indian prefolds. They are still soft but they are definitely rougher than the Indian prefolds (when washed and dried in the same load) It takes 7-10 hot wash cycles to make an unbleached Chinese prefold usable and absorbent. Indian prefolds benefits: Softer cotton, are probably made of gauze cotton. Unbleached diapers wash up quicker (3 washes) More absorbent Indian prefolds drawbacks: May wear out faster than the Chinese prefolds. Depending on the manufacturing company the weight thread used when sewing the ends of the diapers so the thread may wear out faster than the fabric does. When either the Chinese or Indian prefolds are purchased they are quite flat and “thin” They require several washings to get to the nice fluffiness we expect of cotton pre-fold diapers. The diversity of uses in prefolds is literally limitless. They can be used inside pocket diapers, they can be folded and inserted inside appropriate covers and they can be snappied or pinned directly onto the infant for the most efficient fit. The following photo’s will illustrate some of the many ways they can be used. Instead of the potentially dangerous pins they came up with the ingenious invention called a Snappi. It effectively holds the diaper into place without the use of pins. Pre-folds can be folded and inserted into a variety of covers. This method does not require the use of a Snappi. The fit is usually not quite as snug as when a Snappi or pins are used but it is just as effective as far as getting the job done without any extra leaks. Aplex stands for Velcro and snaps…well…Stand for snaps. Heh. At least something is simple in cloth diaper lingo! After using snaps and aplex I have got to say that aplex is by and large a waste of time. It wears out, sticks to other parts of the diapers and tends to get tangled up in the wash regardless of the preventative measures the manufacturers go to prevent this. The good news is when velcro wears out it is relatively easy to replace if you are the crafty sort. Most brands and diaper models come in both snaps and aplex for the same cost. In my opinion the long term investment is more sound with the snaps. Some say it takes longer to fasten the snaps than the velcro but in my personal experience the extra time is negligible. Snaps are particularly important for covers in my opinion. Worn out velcro on fitteds can still be used with a good cover to hold everything in place but if the velcro is shot on a cover it’s un-usable until fixed. If you are investing in one size fits all pocket diapers, fitteds or AIO’s I would also cast my vote with snaps vs. velcro because you will need them to last as long as possible and they will be getting longer term wear and tear. There are three primary types of material available for covers. The most natural and in my experience most effective for absorption is Wool. It is beloved for being absorbent, almost completely waterproof and allows airflow all at the same time. Wool cannot be dried in the dryer but must be air-dried and it takes quite a long time necessitating more covers than with the other two options. Unless you have the talent and skill to make your own wool covers wool is the most expensive of all of the cover options. They cannot be washed in the washing machine but require hand washing. The upside is that they only have to be washed every few weeks due to the anti-microbial action of the protective lanolin in the treated covers. There are many tutorials on-line with instructions on how to make your own if you are so inclined. I personally bought some wool sweaters at a second hand store and had a friend convert them into wool covers for me since I lacked the skills to do it myself. They worked really well and I would definitely do it again in the future. I used them for overnights. The Synthetic version of wool is fleece which is not as water resistant/water proof as wool but it does allow for airflow. Fleece can be dried at low temps in a dryer. Polyurethane Laminate, or PUL, can be said “P-U-L” or “pull”. This laminate-backed diaper fabric was originally developed for the medical community, but it’s softness, flexibility and water-proof qualities make the perfect choice for cloth diaper covers. PUL was meant to be autoclaved so it easily tolerates high dryer temperatures and heavy use. PUL is used in most diaper covers and all of the AIO and Pocket Diapers. PUL does not allow air flow at all so may not be the best option for the most sensitive skinned babies. These are by far the cheapest diaper cover options available although even with that side there are widely varying prices by brand. Covers also come in one size fits all options and in my opinion are the most cost effective even though they cost more up front. For those that involuntarily gag at the thought of dunking a poopy diaper in the toilet or heaven forbid manually scrubbing it off modern cloth diapering has two wonderful solutions. 1) This amazing thing called “liners” They are laid down in the diaper and are between the baby’s bottom and the diaper. They allow the moisture to go through and the solids are caught. They can be flushed into the toilet. Most of them are designed to be re-used (rinsed out) if they have just been exposed to urine. Especially if the “lightly” used ones are recycled they in no way negate the savings of cloth diapers. The softest ones available are from Bummis Brand. Due to their very soft nature they don’t last as long as the rougher Imse Vimse brand. 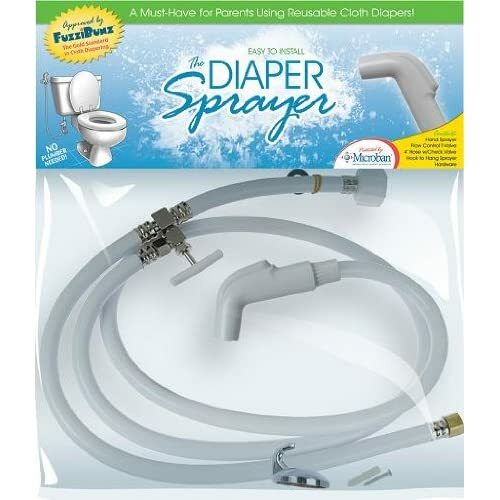 I personally preferred the Bummis both for it’s softness against baby and also because to me it seemed like it would be easier on our septic system. The hardier Imse Vimse may be slightly more cost effective but are not as user friendly in my opinion. Option 2 is a marvelous little spray attachment that can be purchased and attached to the toilet. No more dunking/swishing or scrubbing. If something is stuck on simply spray the diaper off into the toilet and drop into the diaper pail or wetbag until washing time. Important to note: Keep in mind neither liners nor sprayers will be needed until solid foods or formula is introduced. Breast fed babies poop can be put straight in the washing machine without any problems at all. There is a great deal of discussion out there about the various merits of what they call a “wet pail” and a “Dry pail” methods. Having done both in my opinion “dry pail” wins out every time. We started out using a simple five gallon bucket purchased from Lowe’s for our cloth diapers. Later I graduated to an official “wet bag” hung on a door knob. Wet bags are these marvelous inventions with zippers on the bottom to make it oh, so easy to dump the soiled diapers into the wash. “Look Mom! No hands!” Once the diapers are into the washing machine the bag can be tossed in after it. My bag has a sewn in strip of micro fiber cloth so that essential oils can be dripped on it for odor control. My main bag is made by Fuzzi Bunz and is quite large. It easily holds 3 to 4 days of constant use cloth diapers for one child. For a full time cloth diapering family I would highly recommend two and perhaps even three wet bags. Last but not least. A list of my favorite websites to purchase from. I am in no way guaranteeing their products or their customer service but I have personally used each of these companies and had good experiences with them. Plus, they are all great places to further your cloth diaper education. For education I highly recommend Green Mountain although you will find them biased against most synthetic fabrics. If you are looking for a fantastic bargain and have an active craigslist in your area this can be a great way to get your hands on some gently used cloth diapering supplies at well below retail cost. Welp, as the Cartoon says “That’s all folks!” I’m sure I’ve left quite a bit out but even with that I’m now over 2900 words making this the longest blog post I’ve ever made. My apologies. I did try earnestly to keep it as to the point as possible while still covering most of the bases. Please feel free to bombard me with questions…I’ll do my best to answer and point you to the resource that can best clarify any confusion I created. I would love feedback and opinions, especially for any other Mom’s who cloth diaper. =) As we all know cloth diapering favorites ends up being a highly personal opinion and although I’ve tried to keep the general info relatively unbiased I’m sure my personal preferences came through loud and clear. Great article Steph! I wish we had had the snappi thingys back in my baby diapering days……makes a cloth diaper fit so neatly around the baby. I used prefolds and also the full size flat ones I had to fold myself…….I only stuck myself a few times with the big (but cute) diaper pins…….never heard of a Mom sticking her baby!! Wow — that’s pretty thorough! I’ve loved using cloth diapers. My baby almost never has a rash. Aaaannnnd, now that Bethany introduced me to the magic of hemp inserts, his clothes stay dry all night long! It’s wonderful. Hey Steph! You did a great job on this,exactly what I wished for when I first started researching CD! We used them on Elsie and now on Noah. We went with prefolds and are really pleased with our choice since we wanted to use the clothesline frequently. I am struggling with some diaper rash right now, do you think I should try soaking in borax ( friend’s recomendation) or is there something else you would suggest? Hi Amanda! =) So glad you guys are enjoying cloth diapering. I felt like a lone ranger when we decided to do CDing with the Doodlebug. So many Mommies find it too inconvenient to even consider. Hmm. In regards to diaper rash…I’m not familiar with the soaking in borax method. I had always been told to avoid borax with cloth diapers because it wears them out and damages the fibers so badly…That was probably intended for regular usage though and not a once in a blue moon stripping/soaking time. The things I’ve heard suggested for diaper rash trouble shooting with diapers is to “strip” them just like you would when purchased brand new. Sometimes there can be a buildup of laundry detergent even if the “right” kinds are being used. This can be solved by several cycles in hot water…They say to check the water for suds and keep washing/rinsing until the water is suds free. Some Mom’s have had success “boiling” their diapers in hot water on the stove top and this serves to strip and kill any possible yeast/bacteria that may be surviving the normal washing times. The last thing is sunning them but it sounds as though you already have them outside in the sun quite a bit already. Have you been able to line dry them through winter? In my experience a good ‘sun’ bleaching does away with a lot of rash causing woes. The only other thing I can think to ask is if you changed detergents recently? Our daughter was hyper sensitive to all but two detergents and I had a frustrating time trying to find them when I ran out and sometimes would have to go through the whole trial and error thing again finding one that would work for her skin. Here is a link with info on trouble shooting CD rashes. thank you for the article, steph. i’ve been thinking about using them with burr but it’s a bit overwhelming to try to figure out what i need.